If you're looking for a fan film that proves The Joker is even more menacing when he says nothing and simply acts or maniacally laughs - then buddy have you come to the right place. Batman: The Last Laugh is a high production fan film that will blow your bat-lovin' mind in all the right ways (and even some that aren't). 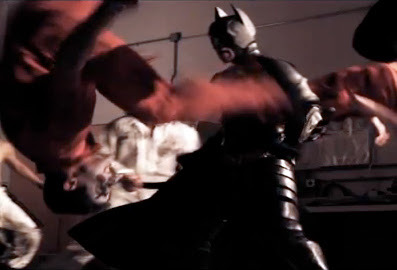 With stunning fight scenes, cameo's from other Gotham nasties and more - it's a champion effort from the stunt team at ENSO Productions and Gotham City FX. At 15 minutes long it is a fair chunk of time, but believe me it's more then worth it. And besides if yer boss catches you - just tell them it's Batman vs The Joker - they'll understand. Wow! That fan video really is good! Thanks Dale - yeah I thought it was pretty sweet! Wasn't the Penguin well cast? Makes me want to learn a few stunt moves myself. oh that video looks like it was a lot of fun to make. i suspect i'll get myself in a situation around here someday not so much unlike Batman in which he finds himself fighting multiple henchmen at once. i better remember those moves. You better stay safe mr! Speaking of henchmen though - howcome I never saw that on the career advisor's list of possible options in high school. I hear it pays well - and the job title sounds pretty cool!